It’s Tour de France time. We’re onto the second weekend of the annual, three-week event and the drama is as complex and captivant as ever. I have been following Le Tour since the days when the only UK reporting was a small paragraph at the foot of the sports pages, long before any TV coverage. I opined for earlier days in Italy when RAI Uno carried it (and the Giro d’Italia and the Vuelta de Espana ) live from starter’s gun to finish line. Now ITV4 is doing just that. Who says we aren’t getting more European? It’s not just the metropolitan elite watching. 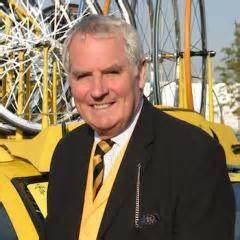 With the extra long coverage comes the shifts of commentator pairings, unlike days of old when the late David Duffield carried the mic for Eurosport for several hours at a stretch, mainly alone and often when there was very little happening on the road. He regaled his listeners, a la John Arlott, with details of his gormandizing, personal anecdotes and musings – I remember one fantastical riff during a particularly dull stage in the Giro on the nature of rocks. There are professional bike riders today who will tell you that it was Duffield whose passion and encyclopaedic knowledge ( and wonderful, surreal imagination ) inspired their own love of the sport. The web-site We Love David Duffield attests to his many fans. One of the rising stars with whom Duffield occasionally shared the commentary box is now a fixture on anglophone Eurosport. 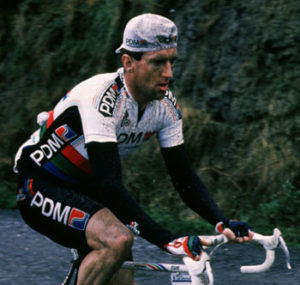 This is cycling great Sean Kelly, former winner of the Tour’s Green jersey (four times), the Vuelta and Classic and stage races too numerous to mention, (check out his palmares in the Cycling Hall of Fame, it’s incredible ). Yet, when competing, Kelly was always regarded as a man of few words, who avoided the media. Now he, along with many international cyclists, is a living embodiment of a pan-european sporting culture. This manifests itself most clearly to TV viewers and listeners in his language. Even cycling fans predisposed to hero-worship acknowledge his linguistic idiosyncracies, what critics have called Kelly’s mangling of the English language, with his ‘bonification’ (bonus points) and ‘final’ (used as a noun, meaning the last kilometer). We wait with bated breath for the first appearance of each ( ‘bonification’ was first uttered on Day 2 this year, to hurrahs in this household ). But, actually, what Kelly does is to speak in a mixture of languages – mainly his mother tongue, but also French, Italian and some Spanish. The languages of the peloton (not, I would point out, the equivalent of Spanglish or Franglais, but something altogether more complex and refined). ‘Bonification’ is a French word, le sprint de bonification is a bonus sprint, expanded by Kelly to mean any bonus points on offer. ‘Final’ is used ubiquitously by cyclists to mean the last kilometer of a stage or race. Nonetheless, sometimes the languages merge. 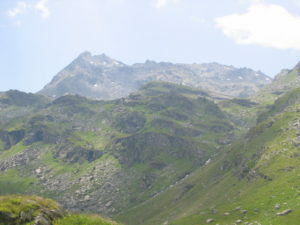 A recent example of this came during last Sunday’s stage to Chambery when the final climb was up the fearsome Mont du Chat, persistently referred to as the Monte de Chat by Kelly, an italo-french hybridisation. As someone who constantly struggles to separate Spanish and Italian I sympathise (Spanish friends tell me I speak Spanish like an Italian – an Italian who doesn’t speak Spanish very well, I always reply, or an Englishwoman who has mislaid both languages). There have been formal attempts in the past to contrive a universal language, like Esperanto, which have never gained wide acceptance. Outside of numbers, which may have a beauty of their own, but only to savants, the closest amalgam I know of is this demotic of the domestiques, or patois of the peloton. Spoken fluently by Sean Kelly. This entry was posted in Culture Vulture and tagged Foreign field by juliej. Bookmark the permalink.